TRIVIA of Noh : Q24 : Is there any special aspect in a Noh actor's folding fan? 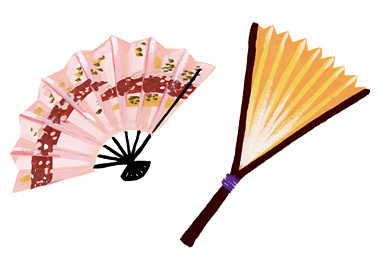 | Home | Trivia | Q24 : Is there any special aspect in a Noh actor's folding fan? Is there any special aspect in a Noh actor's folding fan? Folding fans were born in Japan, and spread over the world. Fans were originally a single face of paper stuck on the ribs, but after double-faced fans were exported to China and then re-imported, they grew sophisticated in the current style, in which ribs are put between two pieces of paper. The fan is one of the important elements in Noh. Though there are some exceptional pieces, almost all of the performers on stage have a fan in their hand. Those mainly held by leading actors are called "chūkei", which keep small fan shapes even when they are folded. The word "suehiro", which literally means "fanwise" and metaphorically describes a glowing prosperity, originally came from this shape of the folded fan. The fans held by actors, reciters, musicians, and supervisors are called "shizume-ōgi," which can be folded normally. There are slight differences among the schools in the styles of the fans, such as the structure of ribs or the patterns of the face. It is a good idea to pay as much attention to the fans as you pay to masks and costumes in the theatre.